With only a few months left in Pitt’s 2016-2017 Year of Diversity, it’s important to take a step back and reflect on how we’ve all contributed to making Pitt more diverse and inclusive this year. We, as an Editorial Board, discussed an incident in our editorial meeting this week that reminded us of how important it is to be actively aware of how we cover diversity in our paper everyday. An Arizona State University graduate student, Nshwah Ahmad, is accusing ASU of racial profiling after a picture of her and two friends — all Arab women, two of whom are wearing Muslim headscarves — accompanied an article about the importance of international students at the university. The article was an op-ed piece submitted by the university’s president Michael Crow to the Christian Science Monitor, a news website and weekly magazine that covers global and national issues. 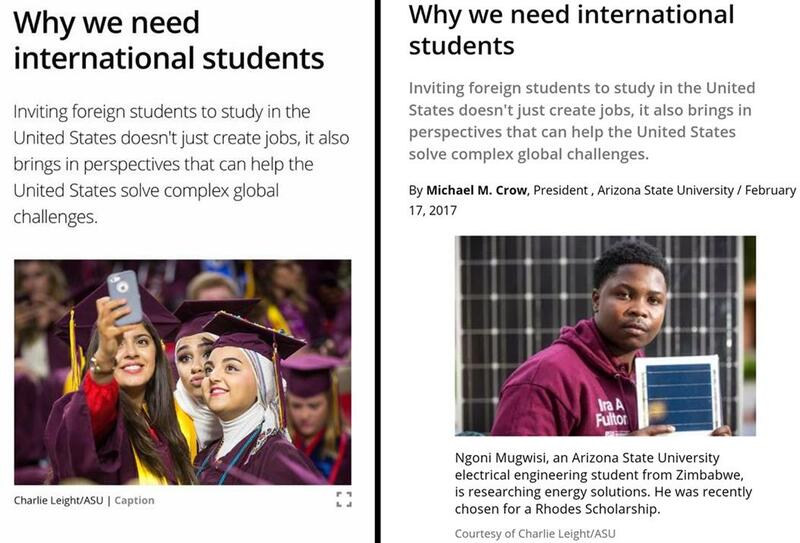 In the article, Crow wrote about the importance of international students at his university and the many benefits they bring the community. But what may have seemed like a triumphant statement by a university president has now become cloaked in controversy. The picture did not have a caption explaining who the women were or specifying them as international students or not. In reality, the women are all Americans but by including their photo in the article, it effectively implied that they are foreigners. The subtle message here says it was because these women are the “other” — because they aren’t white, but are clearly Arab and Muslim, then they must not be American. ASU apologized to the women and replaced the photo, claiming the incident a “mistake.” The paper also overlooked the implications, merely included the photo Crow sent without bothering to properly vet it. Blame can certainly fall on the president, on the media team who reportedly sent the photo and on the editors at the Christian Science Monitor for not being more rigorous and strict with what they plan to publish. And while we should criticize their lack of foresight, we also should use this opportunity to learn from their mistake. We, as a newspaper, understand more than most how easily these mistakes can happen. Deadlines are tight and multiple late nights in a row take a toll on everyone involved in the long editing process. We’d certainly be remiss to say we haven’t come close to or made similar mistakes throughout our history. Earlier this semester, we ran a column about the effect of riots on minority communities with a specific focus on the Korean community in Berkeley, California. With it, we almost ran an illustration that clearly depicted Chinese shops, and the subtext here would have implied much ignorance on our part to recognize distinctions within Asian populations. Luckily, we caught our mistake before it made it into the morning paper. But it was a close call and a learning experience all the same. The ASU example should be another reminder to us to be careful and diligent in our work and in our commitments to diversity. This is where Crow failed in his attempts — he wrote an entire article about the importance of appreciating diversity at ASU but then failed to do the leg work of actually appreciating his students and their diversity. And what may seem like a harmless mistake can be extremely offensive, as it was to Alabbadi and the other women of the picture. Neither Pitt nor The Pitt News is immune to criticism on how we handle diversity and inclusion, despite our stated commitments. For as many things we do right, such as the Year of Diversity, we do just as many things wrong as well. But it’s a willingness to learn from our mistakes, even when we make them, that is what will create change and progress. The solution isn’t necessarily about being so aware that we catch every little possible mistake. It’s about knowing enough to stop and think about how what you say, write or publish might be interpreted by anyone implicated in it. We’ve made mistakes at The Pitt News, but we’ve also made changes to try to be more inclusive of the events, people and community we cover. For example, after multiple mistakes with publishing the wrong pronouns for subjects, we instituted a new policy last year to ask anyone we interview for a story what pronouns they used to try to limit our mistakes to zero. And in light of the ASU photo and our reactions to it, we’re grateful for the reminder again. We stand with a renewed fervor to uphold the ideal of diversity and inclusion not only this year, but for as long as we continue writing for our University.